The future of President Donald Trump’s promised border wall lies in massive pieces in the California desert. 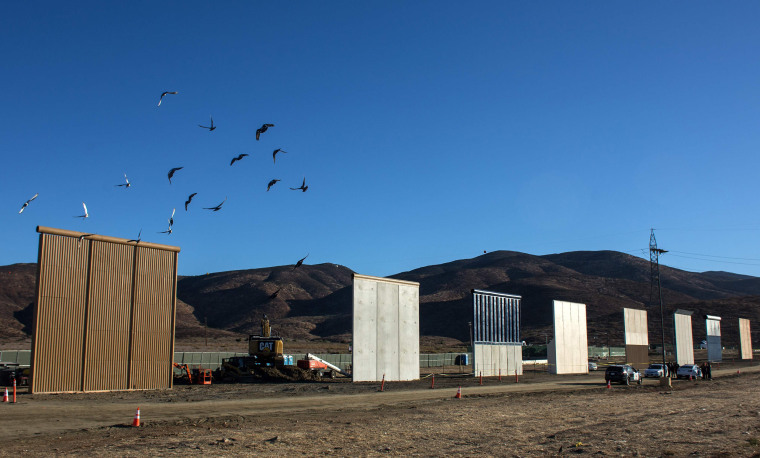 NBC News got an early look at the eight nearly-finished prototypes, assembled near the existing fence along the U.S.-Mexico border miles outside San Diego, ahead of Thursday's deadline for the sections to be completed. Four of the prototypes are made from concrete and are competing for the chance to be used for the concrete portions of the wall. The other four prototypes are made from non-concrete materials that are competing to be used for the stretches of barrier that can be seen through. All are between 18 and 30 feet high. After the Thursday deadline passes, each sample will be tested on several criteria, officials said. According to a rendering released by U.S. Customs and Border Protection (CBP) officials, Trump’s wall has been envisioned as a multi-faceted barrier that features a concrete stretch facing the U.S. and a non-concrete stretch facing Mexico that would allow officials to see through it. This image shows the concrete portion of the wall (E) would sit on the U.S.-facing side of an electronically monitored zone and another barrier (B) — which can be seen through — faces toward the Mexico. The monitoring zone would be about 150 feet wide and alert patrol agents if someone breached the initial border barrier. But even with the prototypes nearing completion, the question over how the U.S. would fund the entire wall remains unanswered. Trump has said repeatedly that Mexico will pay for the wall; Mexico has said just as many times that it will not. The White House’s proposed 2018 budget seeks $1.8 billion to begin building new sections of the wall and replace existing ones, which would include money to build 28 miles of levee wall in the Rio Grande Valley and 14 miles of new wall to replace fences south of San Diego. White House officials have suggested that the entire wall project could cost between $8 and $12 billion, but internal DHS assessments suggest the cost could be higher — as much as $21 billion. Even bigger questions, however, surround whether a massive wall would be effective. Villareal acknowledged “It's hard to gauge” whether a massive wall would cut historically-low apprehensions along the border. “There's always going to be some form of crime, or in this case, illegal migration,” he said. Residents of Mexico put it more bluntly. Aarne Heikkila and Mitch Koss contributed.